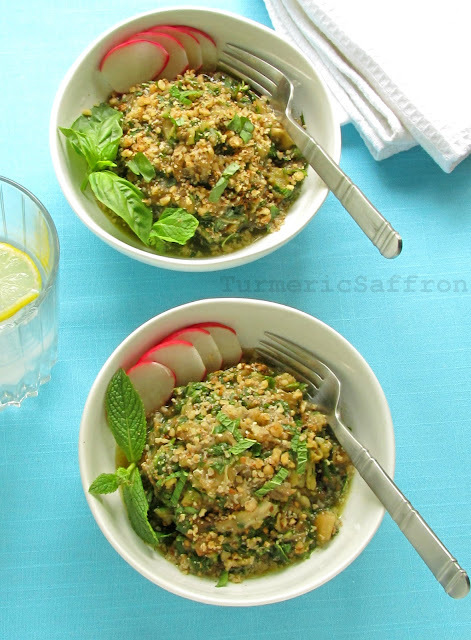 ناز خاتون Naz khatoon is a simple fire-roasted eggplant salad with freshly chopped aromatic and flavorful herbs, minced garlic, infused with verjuice dressing and topped with ground walnuts. 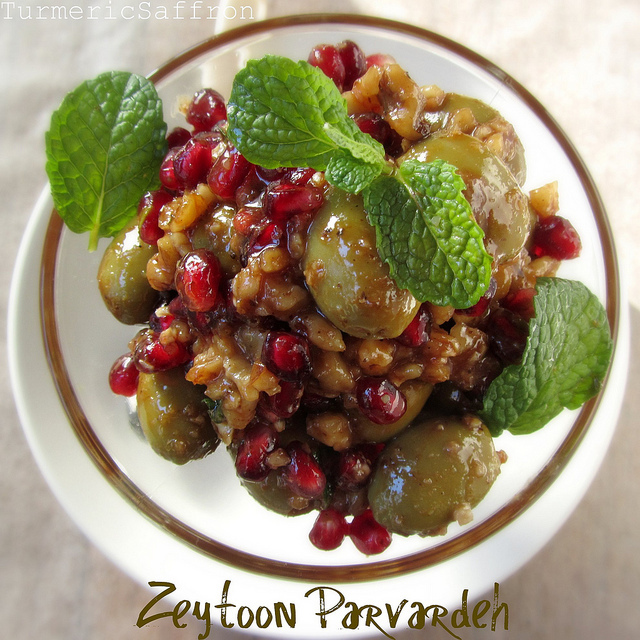 I had heard of this dish in the past and all I knew was that it was a northern Iranian eggplant side dish and I was always intrigued by its name, naz khatoon. 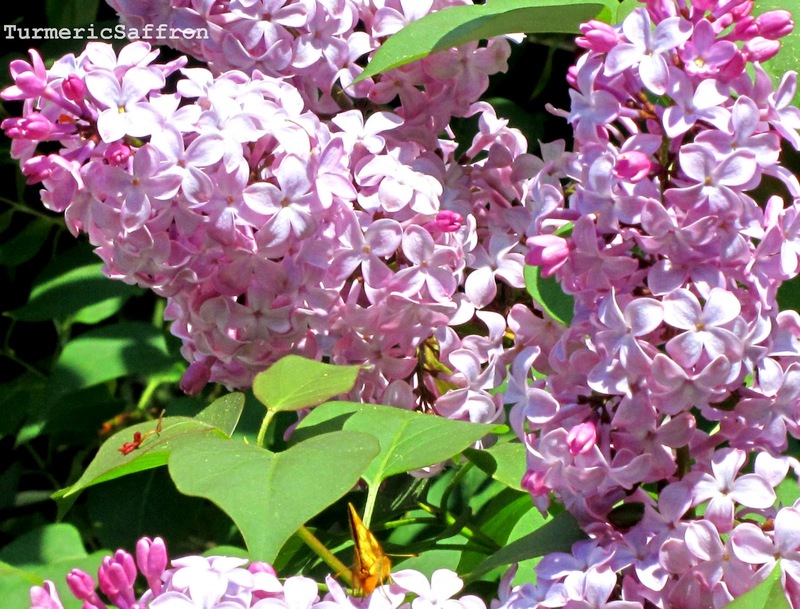 Naz (subtly coquettish) and khatoon (lady), literally meaning coquettish lady. However, it wasn't until recently that I began inquiring about it. As the saying goes in Iran, "jooyandeh yabandeh bovad" (one who searches always finds) and I finally found the recipe that I was looking for. A few weeks ago, a very kindhearted person that I know, who has been teaching Persian language classes on Saturdays with myself and a few other dedicated teachers, lent me a booklet on Iranian regional cooking. 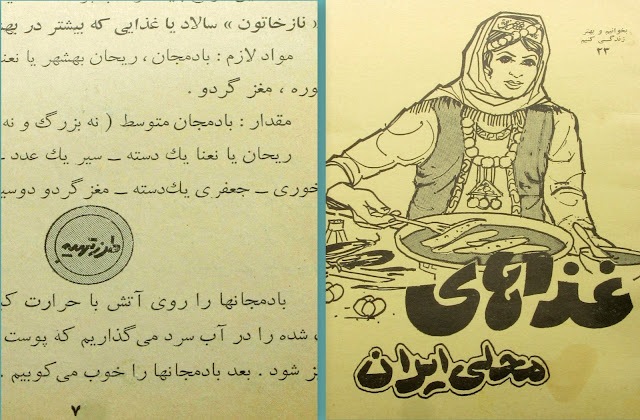 Luckily, in this thin old booklet I found the recipe for Naz khatoon with some information about the origin of the dish. Naz khatoon recipe is from the town of Behshahr which is also the capital of Behshahr county in Mazandaran province in the northern region of Iran along the Caspian Sea. I tried to stay true to the original recipe but I made a few changes. The original recipe called for the use of local Behshahr basil and since that's not available here, I simply substituted the regular basil. The recipe suggests the option of using mint instead of basil. 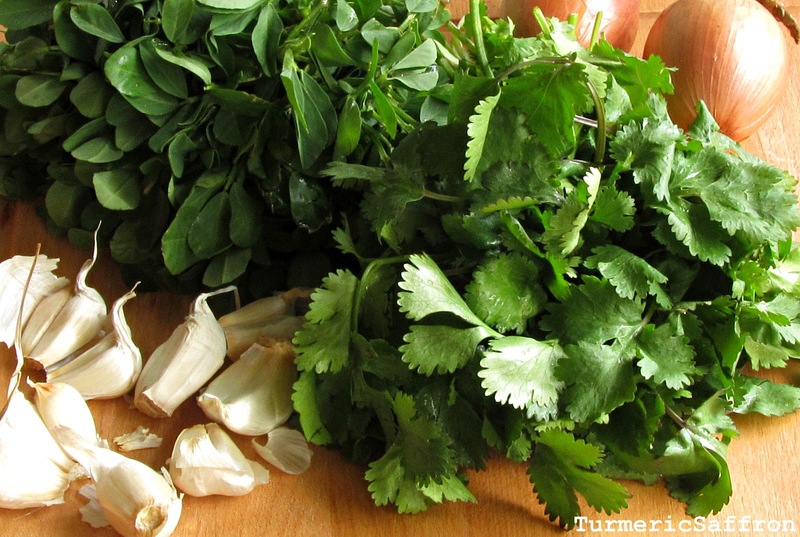 Since both herbs add a burst of flavor and aroma to any dish I decided on using both, with basil as the main herb and half a bunch of mint and flat-leaf parsley. I love the taste of verjuice and in my teens I remember coming home from school and drinking a glass of verjuice. The recipe called for half a bottle (about 2 cups) of verjuice. This amount may be adjusted to your liking. I used about 1 1/2 cups of verjuice for all the ingredients to be fully infused with it, but it may not be evident in the picture. I only used half the amount of liquid before taking photos for the blog so that the texture of the eggplant, herbs and walnuts would show. The only ingredient that was not included in the recipe but that I chose to add was a touch of olive oil before serving to make it easier on the palate. Pierce the eggplant in several places with a fork, place over medium-high fire on a stove or a grill until eggplant is soft. 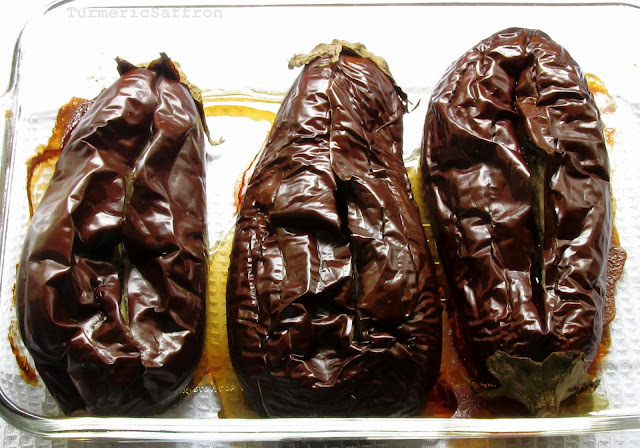 If you are roasting the eggplant in the oven place the pierced eggplants on a baking sheet and roast in a 400 degree Fahrenheit preheated oven for about 50 minutes or until fully cooked. Remove from the oven or the grill and allow to cool in a colander. 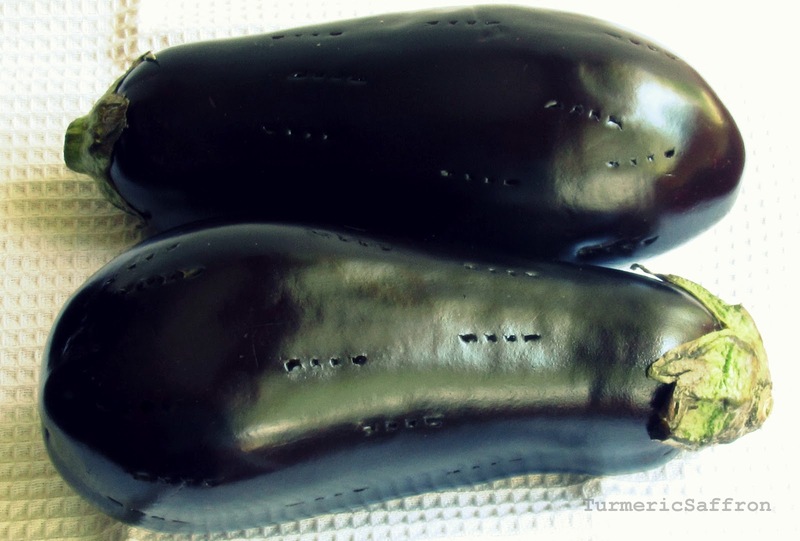 Remove the skin and chop eggplant finely. In a large bowl, combine chopped eggplant, basil, mint, parsley, garlic and angelica powder. Add salt to taste. Pour the verjuice over the eggplant and herb mixture. Mix well. Taste and adjust the seasoning. Drizzle 1-2 tablespoons of olive oil over the salad. Sprinkle ground walnuts over the salad. Serve in a bowl with rice (kateh-style), bread and yogurt. 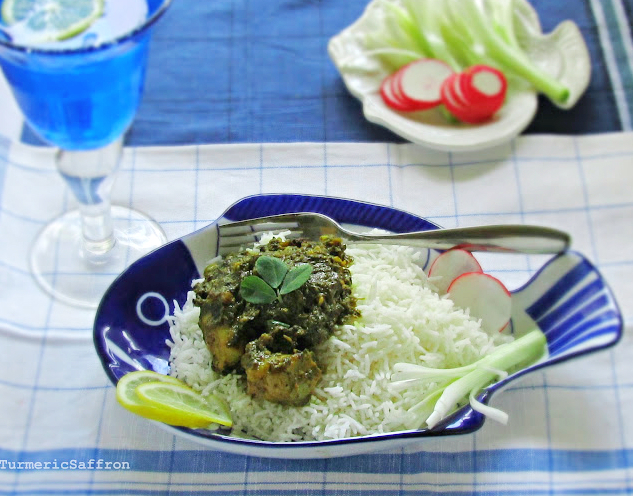 This is my first recipe post after Nowruz and nothing could have been a more fitting recipe to write about than this popular ghalieh mahi dish from my home region of southern Iran. This dish not only tastes great but it also brings back memories from way back when. The aroma of freshly chopped cilantro, fenugreek and garlic simmering away in a red pepper hot tamarind sauce with tender yet firm pieces of fish on the kitchen stove takes me back to my childhood. With a few weeks into the spring season I am once again filled with nostalgic memories of Khuzestan's beautifully perfect but short-lived spring with red laleh (tulips), shaghayegh (red poppy) and wild flowers inside the patches of green fields along the roads and over the hills. Most years we had relatives and close friends of my parents come and stay for the Nowruz holiday. My parents were both very sociable and loved having people over. My mother's cooking around this time of year, when our home was at its busiest, was more delicious than ever, or that's how I would recall! 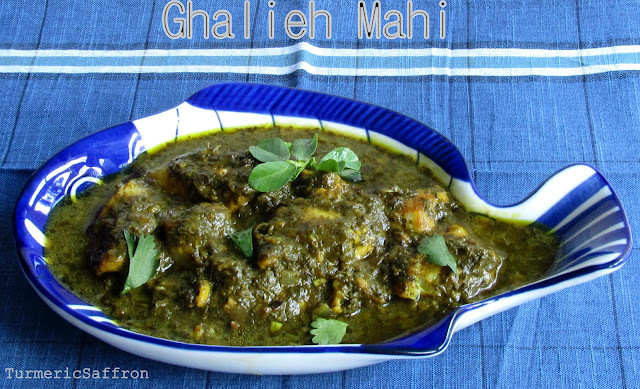 There may be different variations of قلیه ماهی ghalieh mahi however, the main ingredients are fresh گشنیز geshniz (cilantro) and شنبلیله shanbalileh (fenugreek). 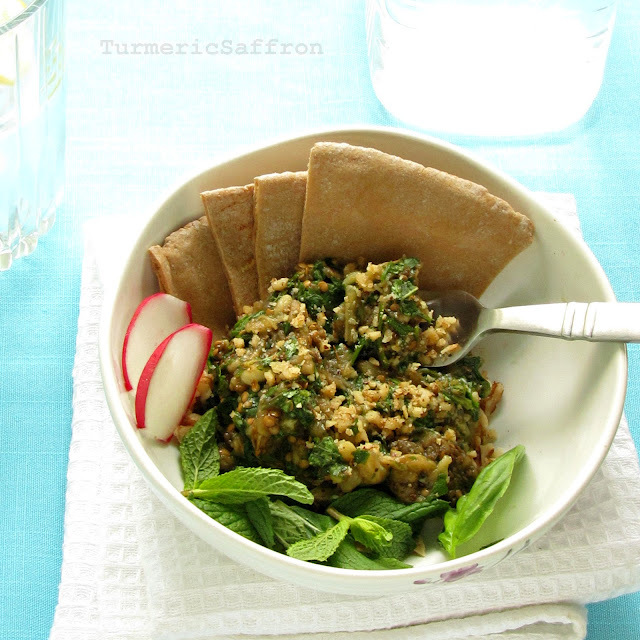 If you can't find fresh fenugreek don't omit it, it's an essential ingredient to this dish. You may use dried fenugreek instead which can be found in Persian/Iranian grocery stores and fresh fenugreek is always available at Indian stores where I live. 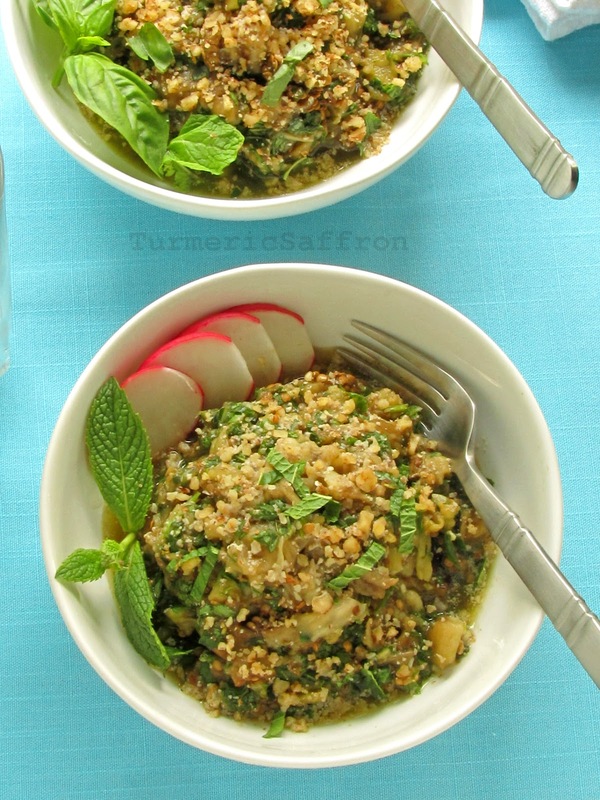 Another key ingredient to bring the sour taste to ghalieh mahi is the tamarind pulp. It's better to buy a packaged tamarind and make your own paste by soaking the pulp in hot water and separating the seeds and stems using your fingers rather than buying a jar of the condensed tamarind sauce. Choosing the right kind of fish is also very important. 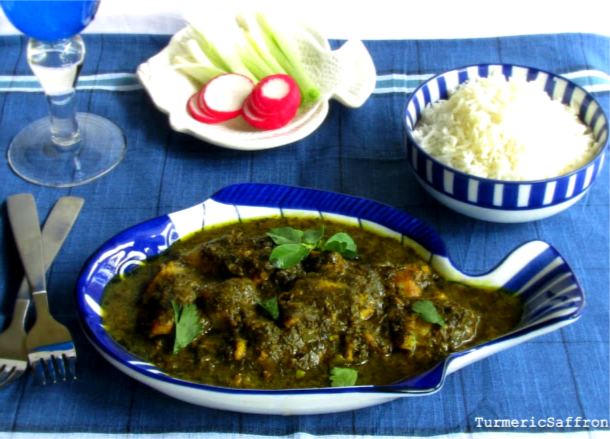 Traditionally, this stew is made with fish from the south of Iran such as sangsar, hamoor, shooride, but I make it with any white fish that has no little bones and is firm enough not to fall part while cooking the stew. Ghalieh mahi is tastiest when made with lots of garlic and some red hot pepper. In the list of ingredients I write the amounts that I use in my cooking, please adjust the amount of garlic, red pepper and tamarind sauce to your liking. Place the tamarind in a small bowl, cover with 2 cups of hot water. When the water becomes cool enough to touch, separate and remove the seeds and branches using your fingers and pass the liquid through a sieve. Set aside. In a small bowl combine the flour with 1/2 teaspoon of turmeric, a pinch of salt and red pepper. Generously coat the fish with the flour-turmeric mixture and set aside for 10-15 minutes. Dust off any excess flour before frying the fish. Heat 2 tablespoons of vegetable oil in a skillet and lightly saute the fish pieces on all sides on medium heat. Set aside. In a large pan saute chopped onions in 3 tablespoons of hot oil until translucent on medium-high heat. Stir in 1 teaspoon of turmeric powder and the minced garlic, cook for another couple of minutes on medium-low heat. Add the freshly chopped herbs to the pan, saute along with the onion and garlic for about 10 minutes on medium heat. Pour in the tamarind sauce, simmer on medium-low heat until all flavors come together for about 15-20 minutes. Gently place the fish in the stew, add salt and red pepper to taste. Add more hot water to the stew if needed. Taste and adjust the seasoning. Cook for another 30 minutes on medium-low heat. Do not stir the stew. Place the stew in a serving bowl and serve with basmati rice.